Hello guys, today in this post I will explain how to download and install turbo c++ in android. I am sure you are aware about for turbo c++. Well turbo c++ is one type of compiler which is specially designed for c/c++ .One can easily perform most of the c/c++ programs with help of turbo c++! We already provided turbo c++ for windows xp/7/8/8.1! Well this post is especially for those who want to do programming in c or c++ in their android phones! So I will provide you guide How to install and use turbo c++ in your android phone! Just read full guide of turbo c++ for android! 4. All the files will be there. You will find to files there .One is "Tc" folder and one is DOSbox apk. 8. You will see black screen like this. That’s it! You have successfully installed turbo c++ in your android phone! So this is the complete process to install turbo c++ in android device! You can easily write the program there and run it on your android device. Enjoy programming on android device! Enjoy c/c++ programming! 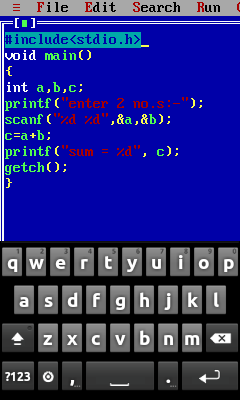 If you have still have any doubts or any difficulty in this post turbo c++ for android device, Fill free to ask! I will help you!